(THE GIST) — A new study published by The American Journal of Public Health found that displaying the number of calories in each of the menu items at McDonald’s has not prompted customers to alter their eating habits, though presumably it at least forced them experience the appropriate level of self-loathing that corresponds to the amount of willpower they’ve shown themselves to lack. 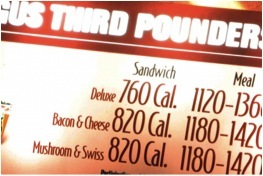 Under pressure to add transparency about the speed at which their customers were eating their way into an early grave, the popular fast food chain first began posting calorie counts in September 2012. In addition to listing calorie counts, McDonald’s has made a point to add to the menu several relatively healthy items customers are not at all interested in, but which help them feel the full weight of their mathematically indefensible decision to, for instance, pass on the Fruit ‘n’ Yogurt Parfait (150 Cal.) for the siren song of the Double Quarter Pounder With Cheese (750 Cal.). The existence of the Caesar salad (90 Cal. ), meanwhile, remains a cruel joke.